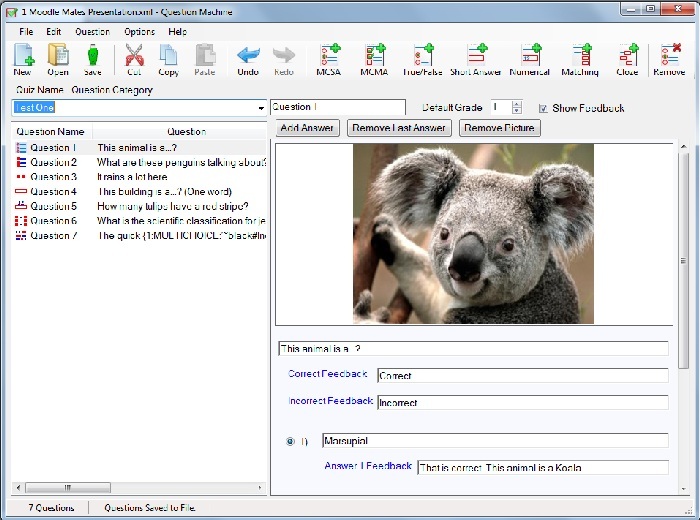 Question Machine provides a user friendly Windows interface for creating quiz questions for Moodle course content. (See Moodle.org). After a quiz is saved it can then be imported directly into a Moodle website, using Moodle XML format. Most Moodle question types are supported. Cloze/Gap fill questions can now be created using a "what you see is what you get" editor, replacing the need to manually create cloze question syntax. New: A spellchecker has been added, along with a thesaurus for finding synonyms. Fourteen languages are supported at this stage. Also the program can now produce a printable test to give to students. The application can be installed easily using the "Click Once" installer. (The .NET Framework 3.5 SP1 is required and may be automatically installed.) A full installation wizard is on the way. Windows XP, Windows Vista, Windows 7 are supported. A version for Apple Macs will hopefully be available later this year. If you have found Question Machine useful please pay ten dollars (US) per user. Funds received will be used to free up time for further development work.